Arthi Nadhan, 17 years old, is a student of Chitravina N Ravikiran. After commencing her training from Smt. Vasanthi Iyer in Chicago, she was regularly going to Chennai to advance her training from the esteemed Vainika, the late Smt. Karphagham Swaminathan and continued her training under Smt. Jayalaksmi Sekhar. Arthi has played in multiple group performances in various Music Sabhas in India. 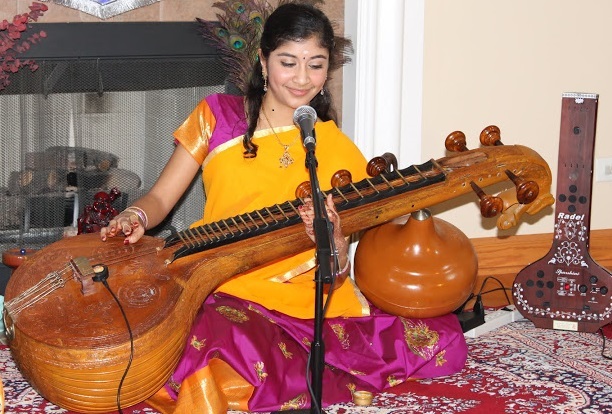 In addition to performing in Veena Venu concerts at the Cleveland Tyagaraja Aradhana and the Balaji Temple, Arthi has also given solo concerts in Chicago, Springfield, Milwaukee, Pittsburgh, and Madison. Arthi is currently a senior at Neuqua Valley High School in Naperville, Illinois.